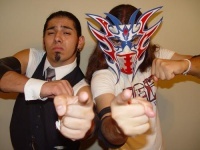 Los Un-Mexicans is a Monterrey stable, better known for their appearances in NGX. The team's name is an obvious riff of the WWE's The Un-Americans group from the mid-2000s. Los Un-Mexicans first signal of life ocurred on December 4, 2004 when the "Japanese" Kaientai ran in to the ring to help the "British" Lord Byron from the attack of Black Soul. At next event of NGX held on January 29, 2005, Lord Byron and Kaientai, in companion with Dark Angel, made their first public appearance as a team. On November 9, 2013, all the five current members came to the ring and after say some things to the public in the arena, Kaientai revealed the creation of the UWO (Un-Mexican World Order) Tag Team Championship, proclaiming themselves as the first champions. That night, Los Un-Mexicans defended two times in the same event the championship belts. This page was last edited on 28 October 2015, at 07:31.